The status of bees was assessed at two regional levels: geographical Europe and the EU 27. 9.2% and 9.1% of the species are considered threatened at the European and EU 27 levels, respectively. However, the proportion of threatened bee species is uncertain given the high number of Data Deficient species, and could lie between 4% (if all DD species are not threatened) and 60.7% (if all DD species are threatened) for Europe, and 4% and 59.7% for the EU 27 (see table below). Thus, the mid-point figures provide the best estimation of the proportion of threatened species. In Europe, 0.4% of the species are Critically Endangered, 2.4% are Endangered, and 1.2% Vulnerable. A further 5.2% are classified as Near Threatened. In the EU 27, 0.3% of the species are Critically Endangered, 2.4% are Endangered, and 1.3% are Vulnerable. A further 5.4% are classified as Near Threatened. For more than half of the species in Europe (56.7%) and in the EU 27 (55.6%), there was not enough data to evaluate their risk of extinction and so they were classified as Data Deficient. As more data becomes available, it is possible that many of these species may also prove to be threatened. *This table does not include the Not Applicable species in Europe (23 species) and/or the EU 27 (16 species) (species introduced after AD 1500 or species of marginal occurrence). For the EU 27 assessment the Not Evaluated species (species which do not occur in the EU 27) are also excluded. European bees belong to a number of different families. The table below presents the status of these species per family and sub-family. 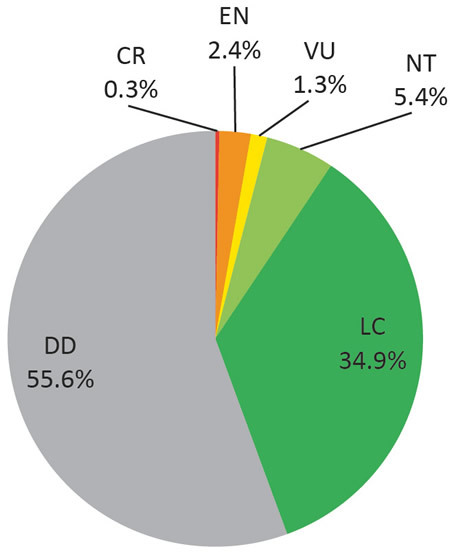 Compared to the European proportion of threatened species (9.2%), it appears that the species in the families Melittidae and Colletidae represent a higher proportion of threatened species (18.9% and 12.8% respectively); while the species in the Megachilidae show the lowest levels of threat (1.1%). However, all the families include a very high number of Data Deficient species. Looking at the sub-families can allow conclusions to be drawn in relation to some behavioural and ecological traits. 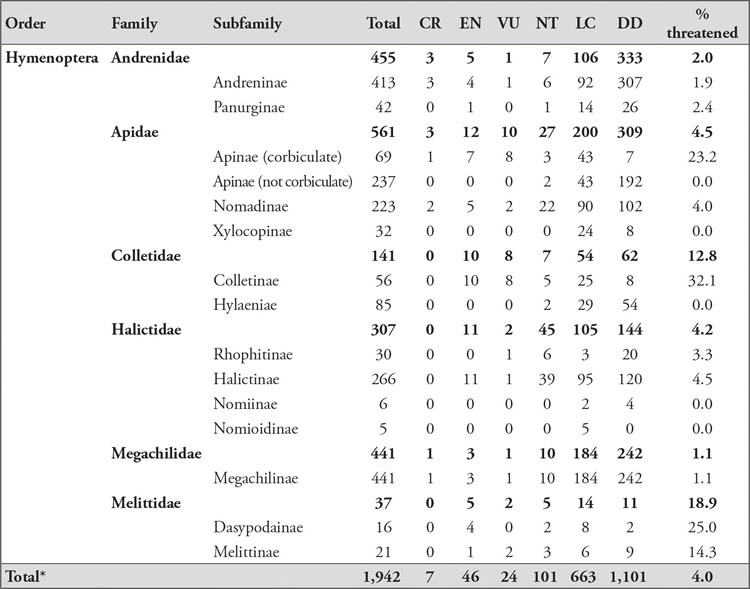 The table below shows that there are 14 sub-families, although the Apinae are divided into corbiculate (pollen basket bees - Bombus sp. and the Honey Bee, Apis mellifera) and non-corbiculate (without pollen baskets). The sub-families that are most threatened are the Colletinae (32.1%), the corbiculate Apinae (23.2%), Dasypodainae (25%) and Melittinae (14.3%). The rest of the sub-families contain less than 5% of threatened species and some have no threatened taxa: Xylocopinae, Hylaeinae, Nomiinae and Nomioidinae. For the Colletinae, Dasypodainae and Melittinae, the higher proportion of threatened species may be explained by their relatively specialised foraging behaviours which could make them more susceptible to changes in their environment. For the corbiculate Apinae, most of the bumblebees are quite unspecialised foragers, however they tend to be more abundant and diversified in colder climates, such as high mountains and boreal and arctic biomes, and have a relatively high vulnerability as their preferred habitats are much more susceptible to climate change. The Near Threatened (NT) status was assigned mainly to the Halictinae (39), Nomadinae (22), and Megachilinae (10) species. 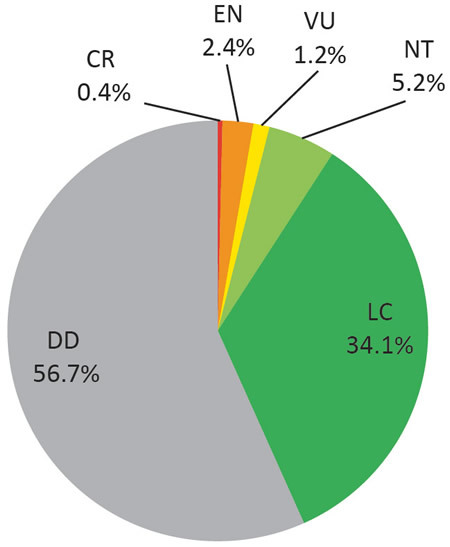 This status was given to species that are clearly declining in large parts of Europe but not to the extent that would trigger the IUCN Red List Criteria thresholds. These species require further study as additional population data may clarify their extinction risk status further. For the sub-families with no threatened species (Xylocopinae, Hylaeinae, Nomiinae and Nomioidinae), some of them are thermophilic, unspecialised foragers that appear to be benefiting from climate change. Some of the Xylocopinae (which include the carpenter bees) have been expanding their distribution for several decades and are clearly driven by climate warming. With regards to the Data Deficient species, the group with the lowest number is the Dasypodainae (2 species) and the Nomiinae (4 species). On the other hand, the sub-families with the highest number of Data Deficient species are the Andrenidae (307 species), the Megachilinae (242 species) and the non-corbiculate-Apinae (192 species). This could be the result of a number of reasons: poor taxonomic knowledge leading to insufficient sampling; the difficulty in sampling the species due to their intrinsic rarity (Nomadinae); or the lack of targeted surveying for certain species groups. *This table does not include species classed as Not Applicable (NA).